I’m feeling a bit nostalgic today. Perhaps it’s because I was flipping through the new Pottery Barn Kids and wishing I was pregnant just so I could decorate another nursery. Or perhaps it’s because I’m selling off a ton of old baby items in attempts to recover some needed cash. Maybe it’s knowing that I won’t have any more babies and my “baby” will be 3 in November. Whatever the cause, I’m feeling all nostalgic for babies….well admittedly more for decorating for babies then for the 9 months of misery followed by colic, reflux, crying, sleepless nights, and blow-out diapers. Anyhow, I thought you might enjoy seeing Zephan’s old nursery! How was that for an introduction? In our last home, we knew a move might be forthcoming and we weren’t ready to do away with our guest room. We creatively incorporated Zephan’s crib into the existing room (which for some reason I don’t have a photograph of) and designed a wall mural to babyify the room. 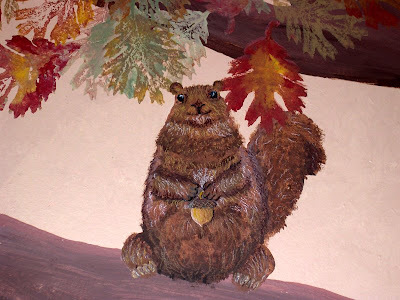 I drew and painted the tree and hubby stamped all those leaves for me and drew my adorable squirrel. The vinyl quote was purchased from Wise Decor and was my inspiration for the entire theme. I love it and miss it. Zephan wasn’t even a year old when we moved so he doesn’t remember his cute mural. But seriously moms, do we ever really decorate a nursery for the baby? Be honest with yourself now. I’ll leave you with a close-up of the adorable squirrel. We had psycho squirrels at our last home that would stare in the windows at us and chew into our home. They were possessed and I hated them. Hubby drew this cute little guy as a bit of joke and I loved it! Isn’t he a good artist? Have a wonderful weekend! 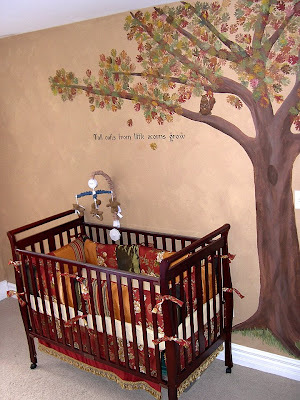 And if you have a baby be sure to enjoy him/her and be sure to enjoy the beauty you created in the nursery. It won’t be there for long! The tree is amazing! 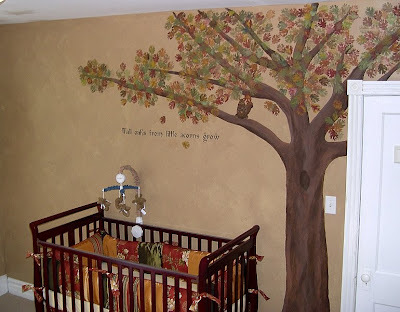 I am Due in december and want to paint a tree in my daughters nursery if by any chance can you tell me how long it took you, and where to find that leaf stamp thing your husband used! Thanks so much! I was really hoping that you would tell the story of how you got his crib bumper by accidentally bidding for the wrong thing on ebay and making it work anyway. I thought it was hilarious! I have to hand it to you, girl, you made it work! What a lovely nursery! 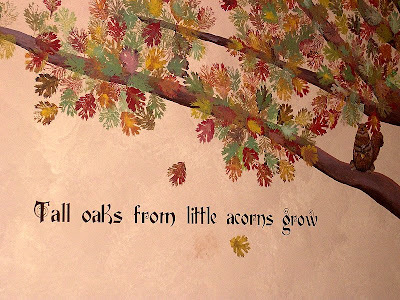 Love the tree, quote, and squirrel!